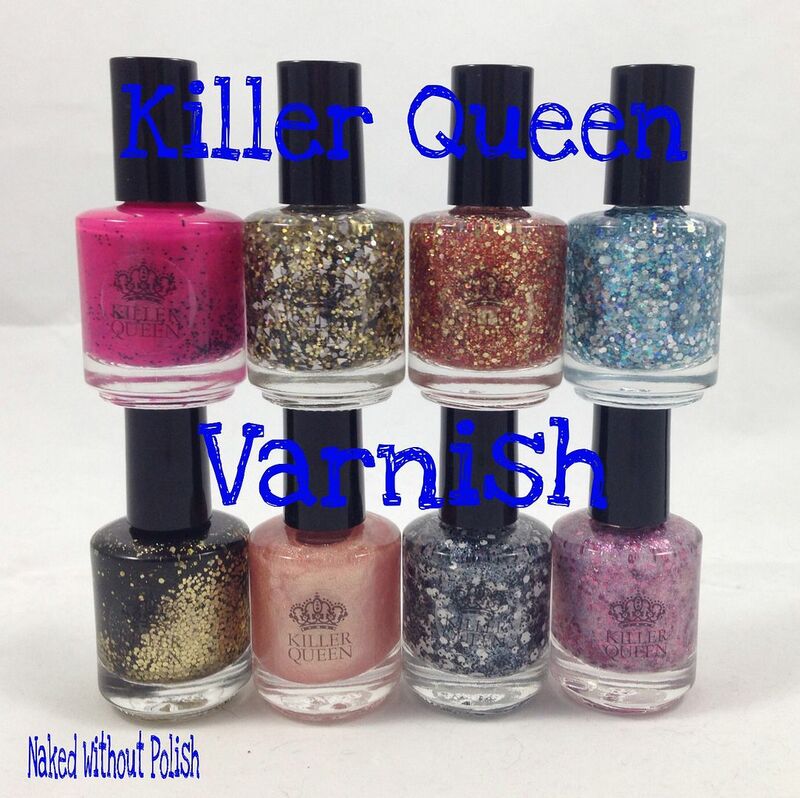 Keep reading to see more about Killer Queen Varnish! 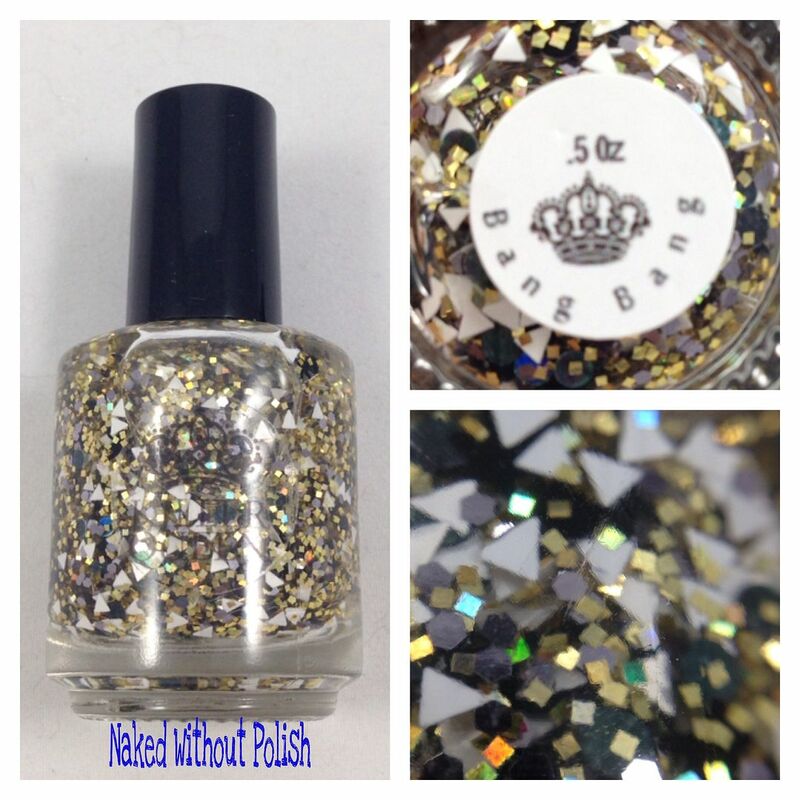 Bang Bang is described as "a clear based glitter topper that contains small black skull glitter, gunmetal hex, white triangle glitter, gold square glitter, and black holo dots". 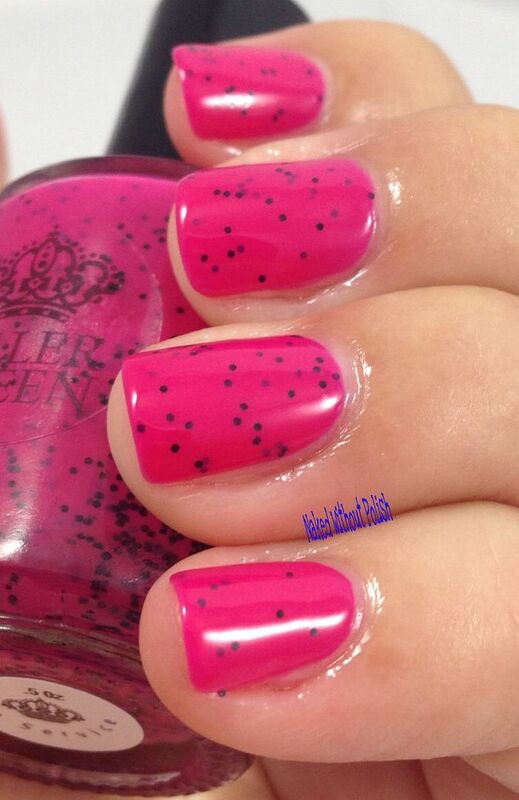 Shown is two coats of Bang Bang over Barielle Boho Chic with top coat. Unfortunately I couldn't get any skulls out o the bottle, but I still loved this polish. With or without them, it's a lot of fun and very versatile. It had a thicker base and required some dabbing, but that didn't bother me. 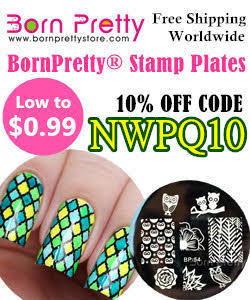 Other than the skulls, there were no issues with this polish. 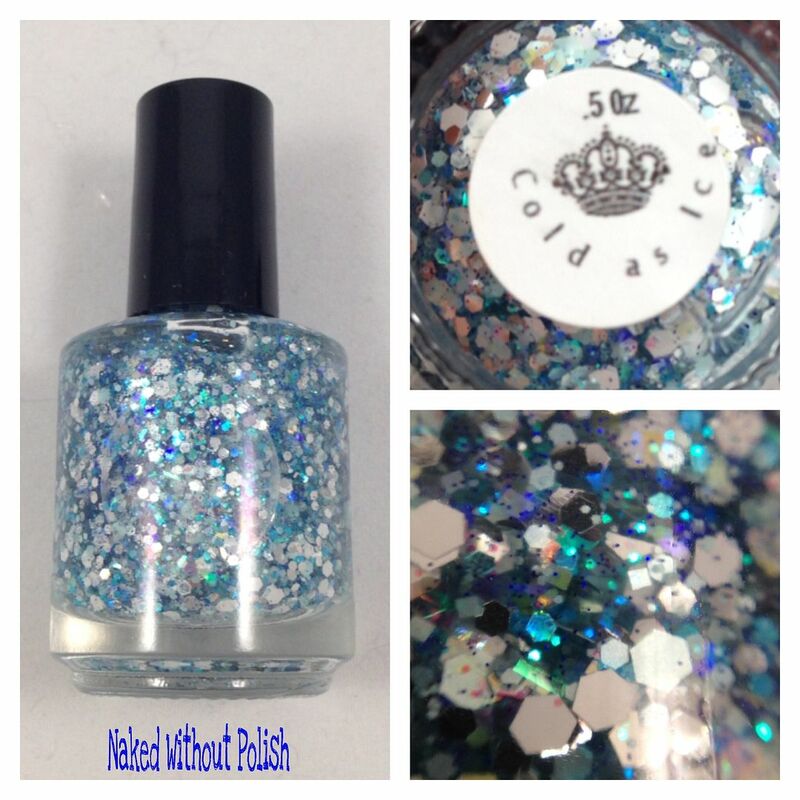 Cold as Ice is described as "a clear based glitter topper that is loaded with white hexes, a variety of blue hexes, silver hexes, and small blue bar glitter". 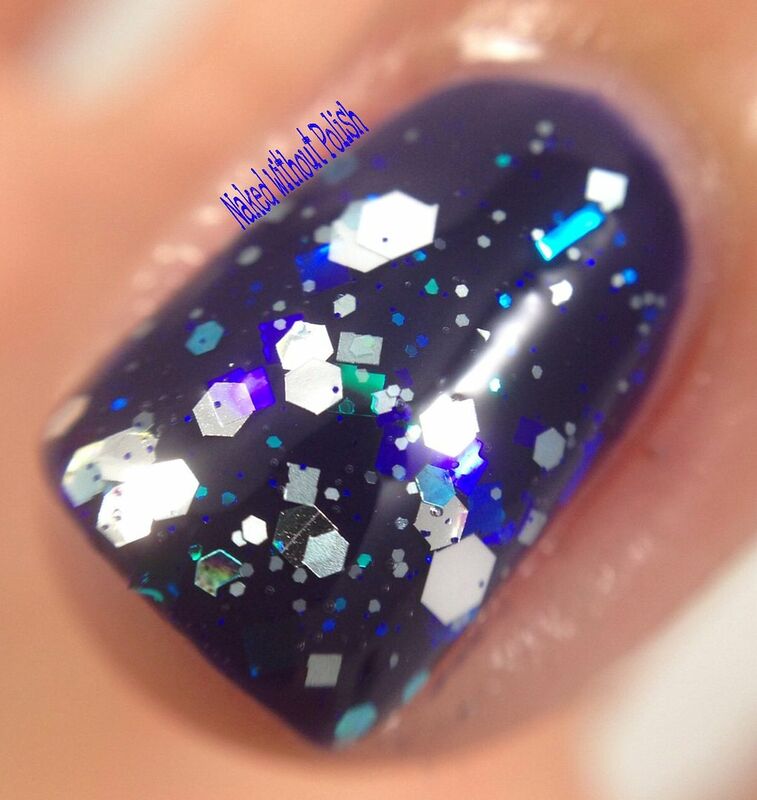 Shown is two coats of Cold as Ice over Barielle Moda Bleu with top coat. Cold as Ice had a much better application than Bang Bang. Still a little thick, but better. 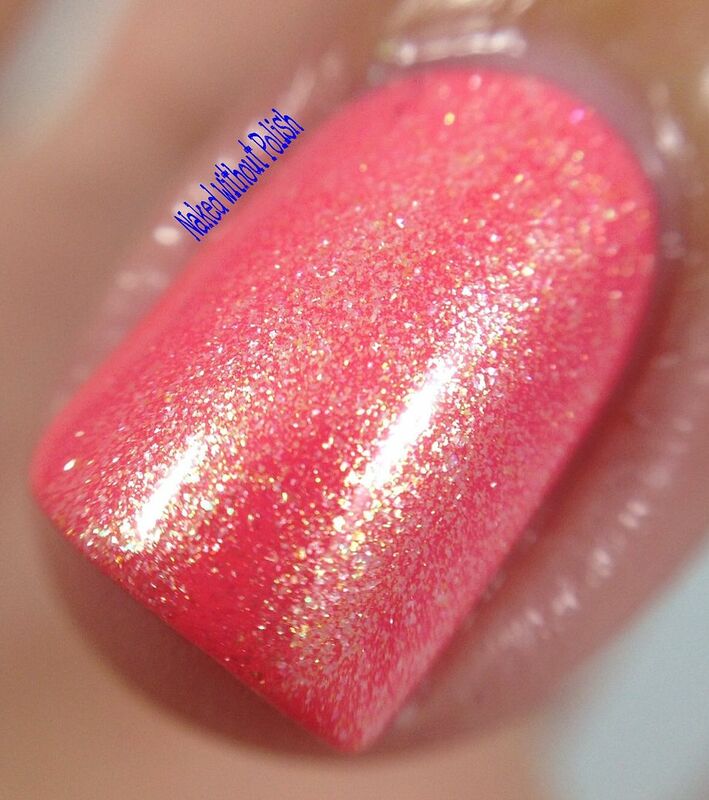 Flowers on the Wall is described as "a peachy polish with flashes of green in the light". 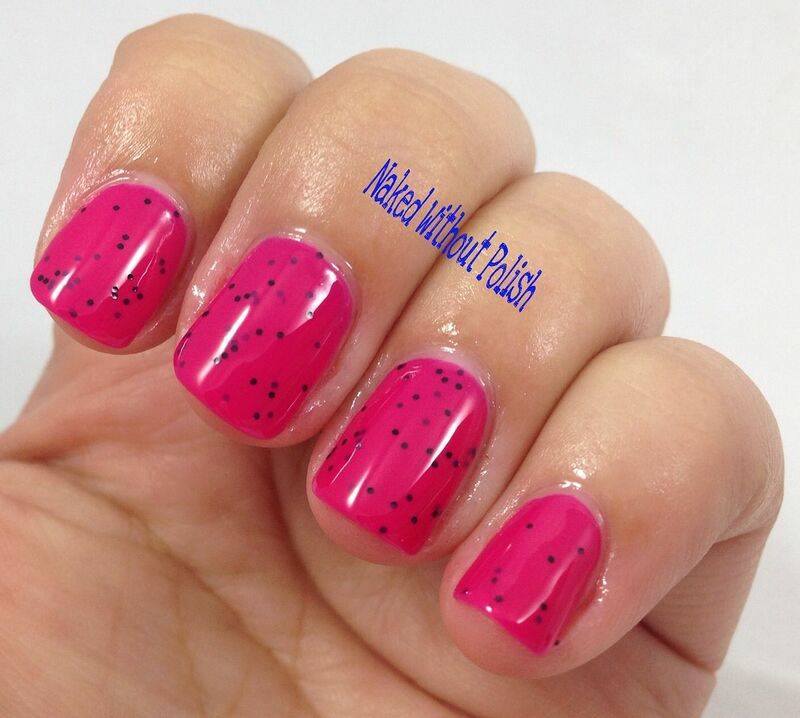 Shown is one coat of Flowers on the Wall over Sally Hansen Xtreme Wear Coral Reef (new formula) with top coat. Application of Flowers on the Wall was perfect! Only the smallest amount is needed for this coverage. 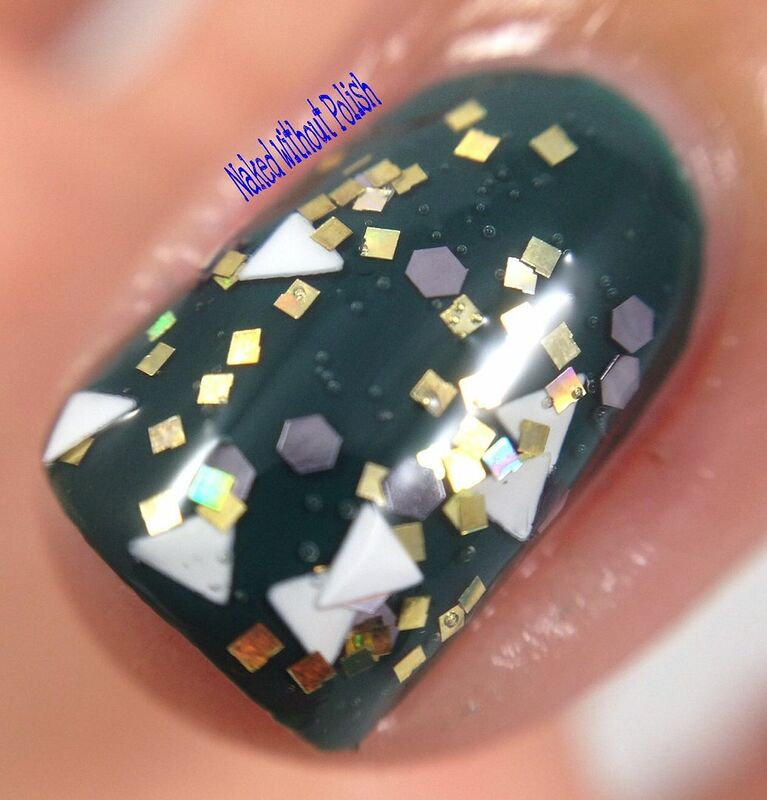 I loved this combination so much, I put it on my toes for the baby shower this past weekend. 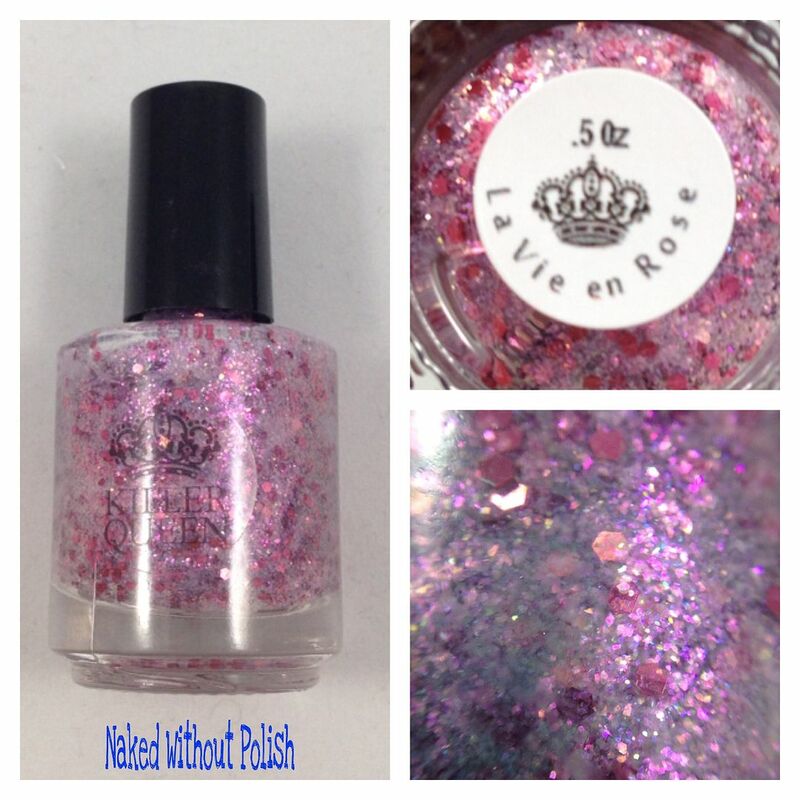 La Vie en Rose is described as "rose colored hexes and rose-purple flakies". 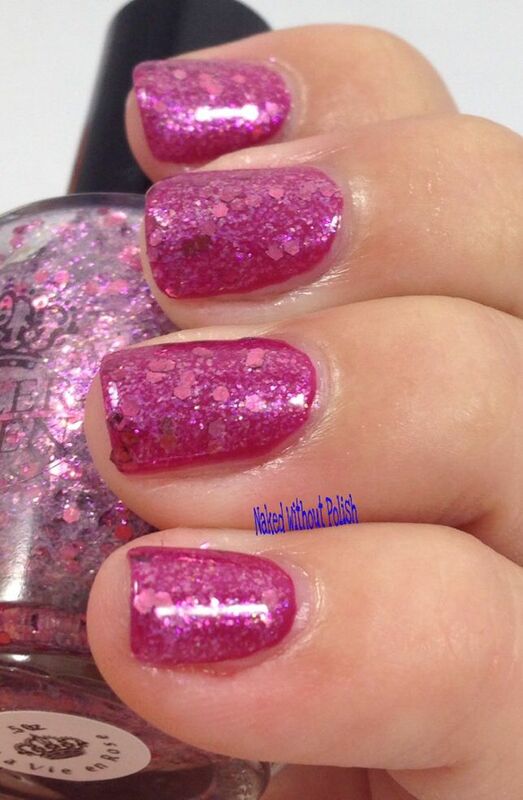 Shown is one coat of La Vie en Rose over Barielle Berry Posh with top coat. 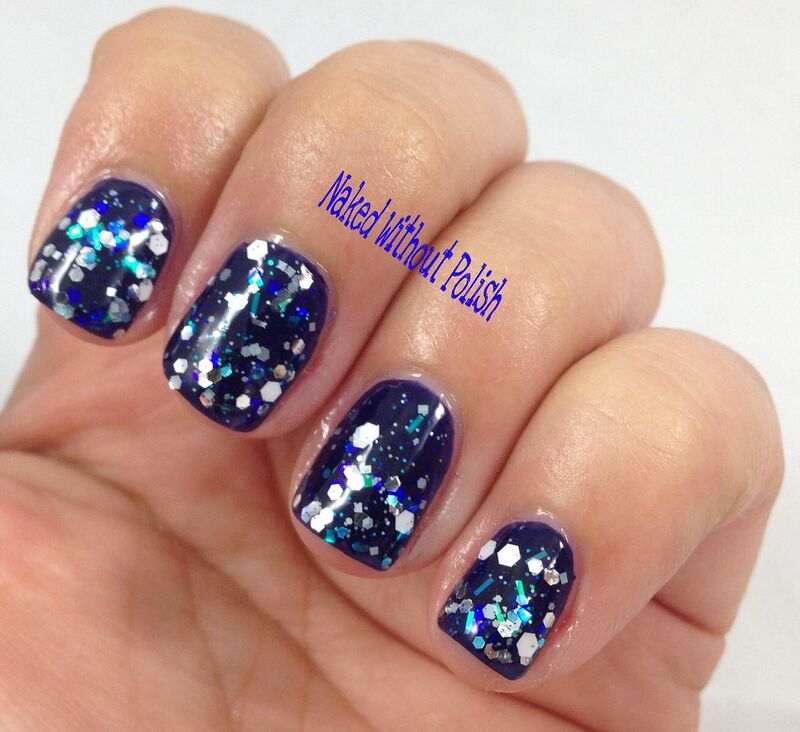 Another favorite from the group she sent me, this one may be chunky, but applied wonderfully!! 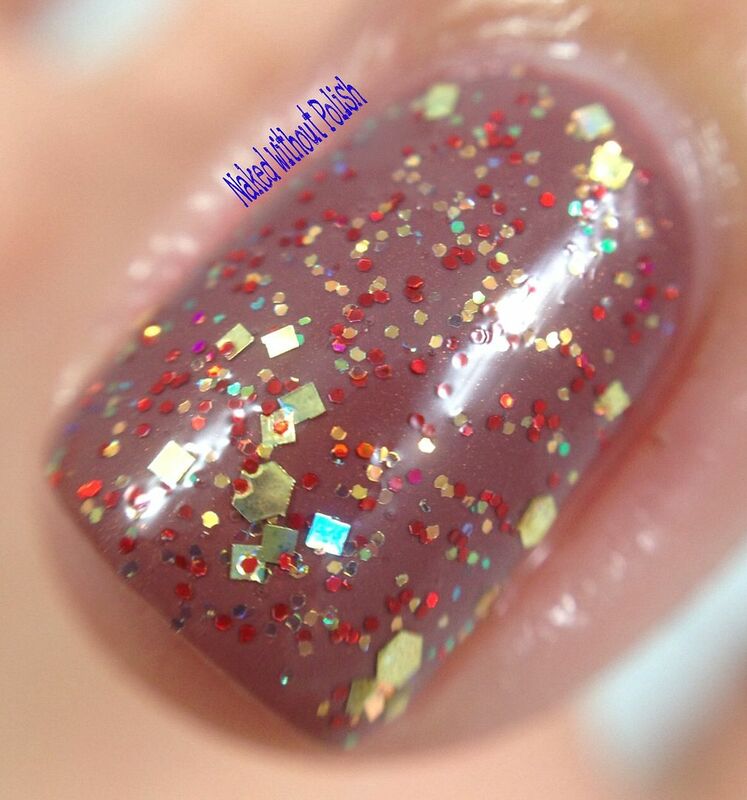 Life on Mars is described as "a spectacular clear based glitter topper packed with small red hexes, gold square glitter, and larger gold squares". 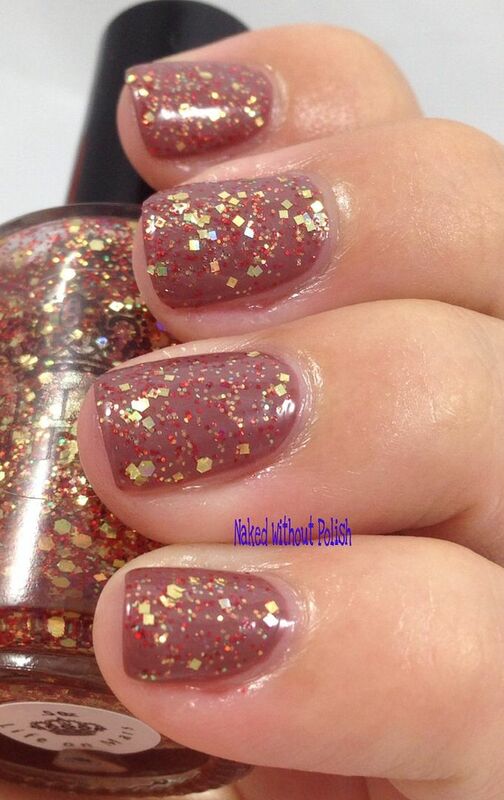 Shown in one coat of Life on Mars over Barielle Vintage Gown with top coat. This one really surprised me. 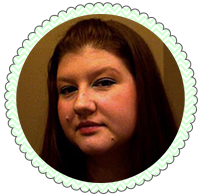 It had a wonderful application, no difficulties. This combination ended up being perfect for fall! 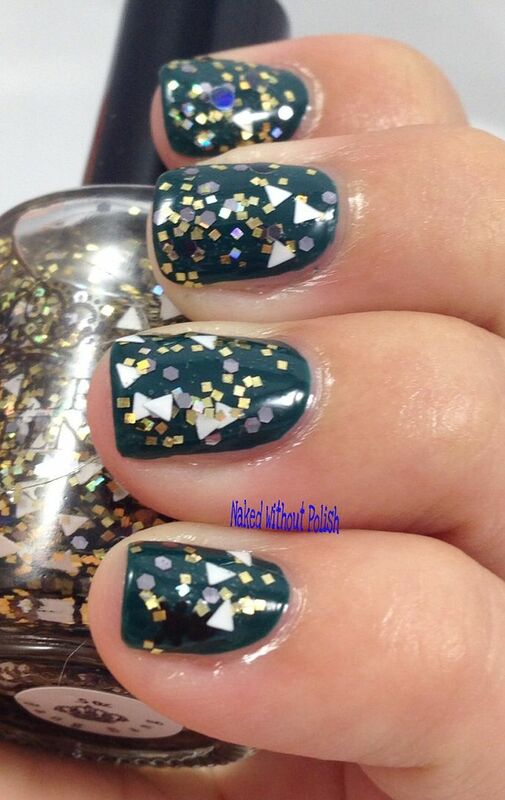 Got me in the mood for the crisper weather, and I will probably be doing this mani over the weekend! 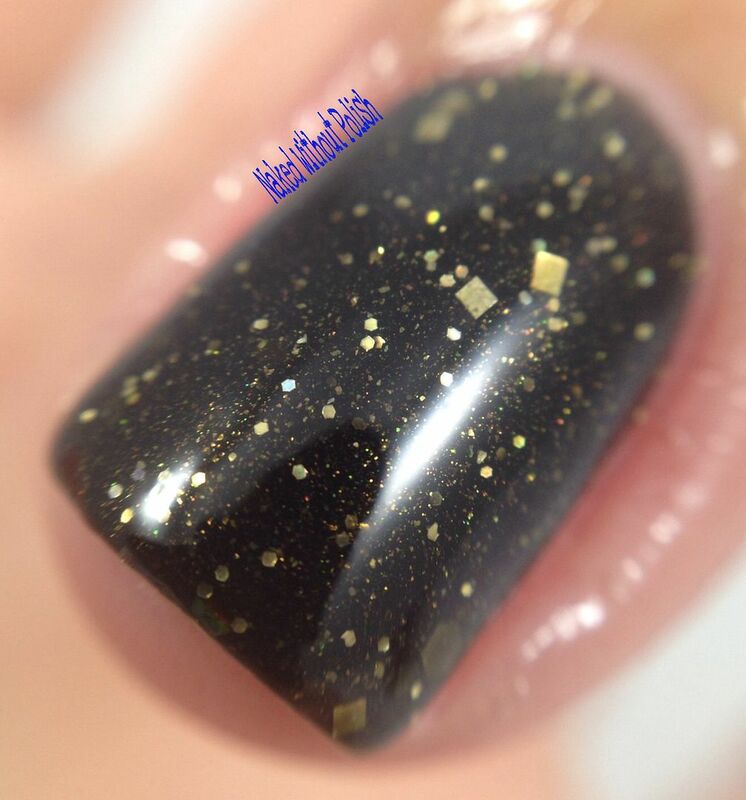 Midnight at the Oasis is described as "a black jelly polish packed with micro gold hexes, small gold square glitter, larger gold hexes, and topped off with a gold shimmer throughout". 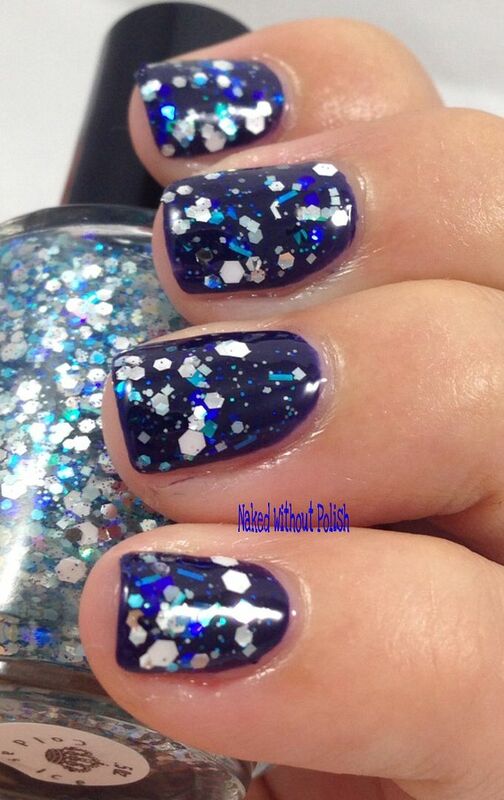 Shown is two coats of Midnight at the Oasis with top coat. 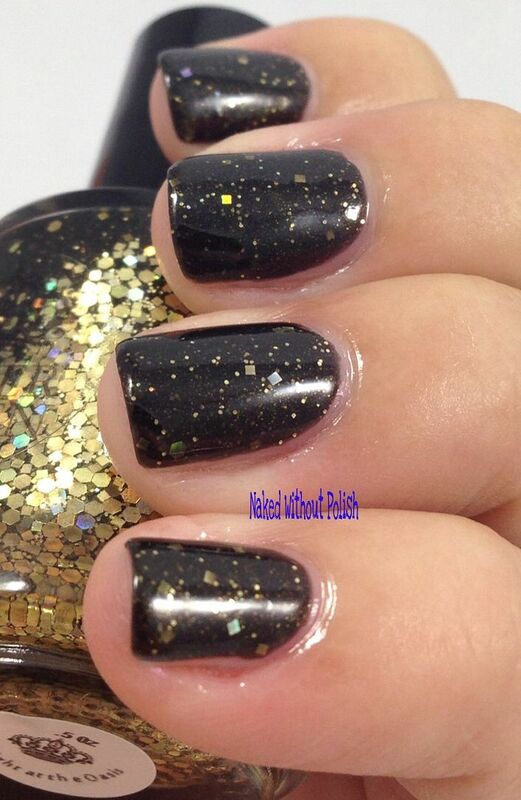 The bottle may look gold square heavy with the way some of it settled, but it disperses well and doesn't end up being overwhelming on the nail. 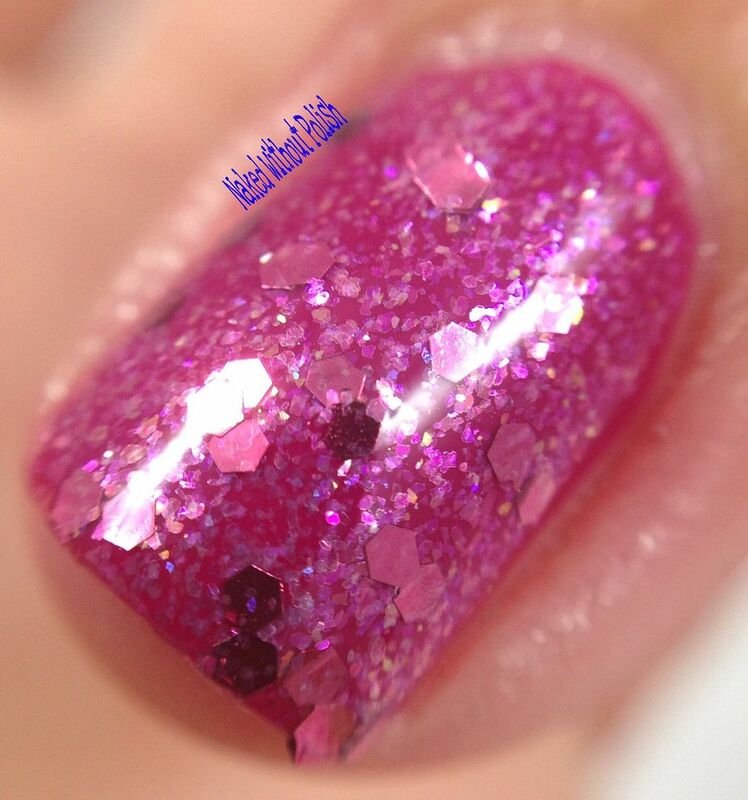 Lip Service is described as "a hot pink jelly sprinkled with small black hexes". Shown is two coats of Lip Service with top coat. The formula on Lip Service was wonderful! It spread like butter. 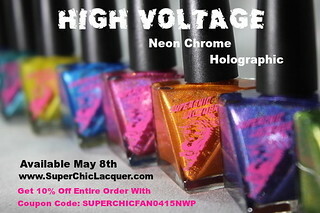 The color is sure to put a smile on your face. White Light/White Heat is described as "". 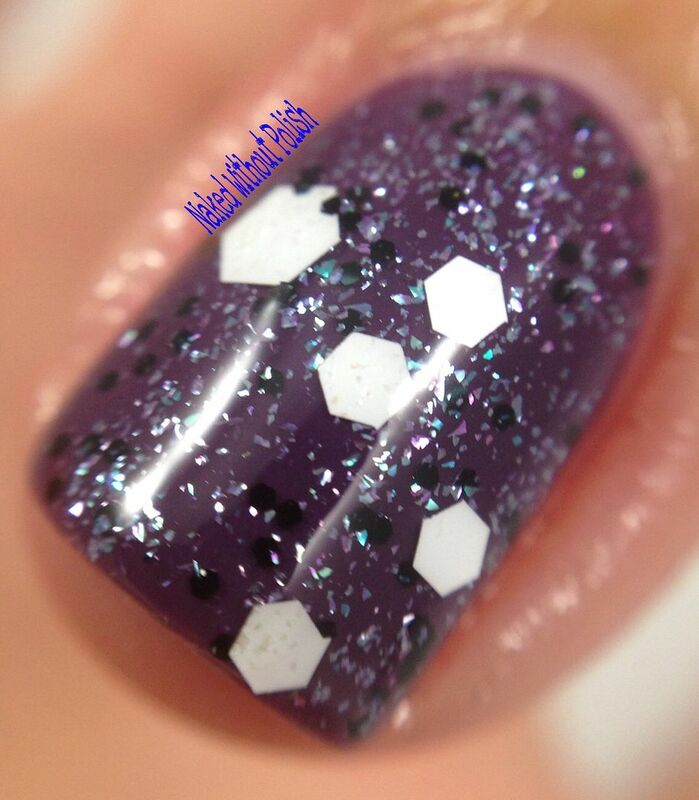 Shown is one coat of White Light/White Heat over Barielle Soho at Night with top coat. 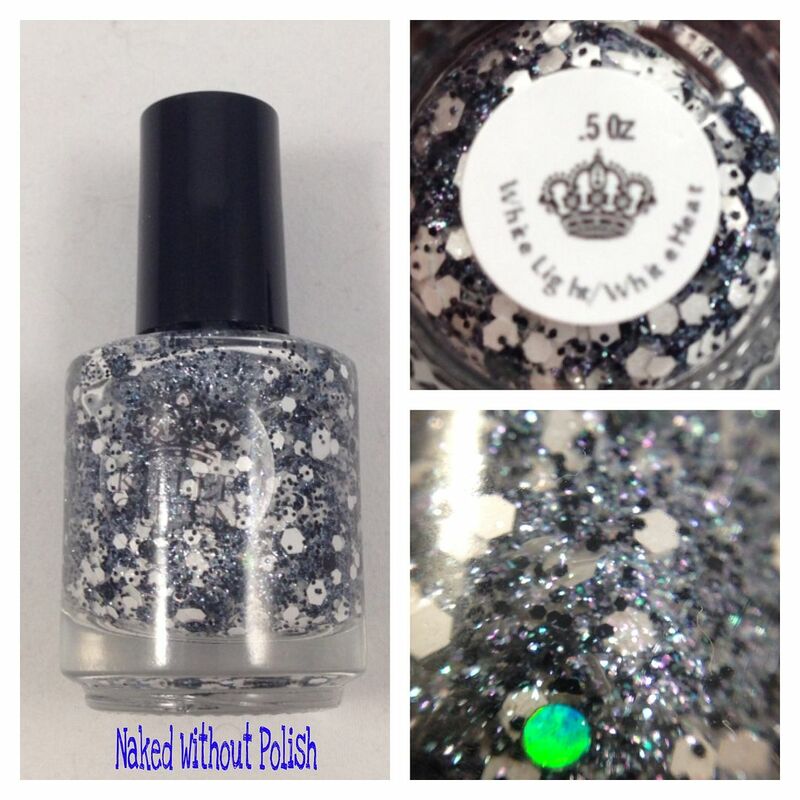 Another extremely versatile topper, White Light/White Heat is one of those toppers you can use to lengthen and completely change up a mani. It's a must have! 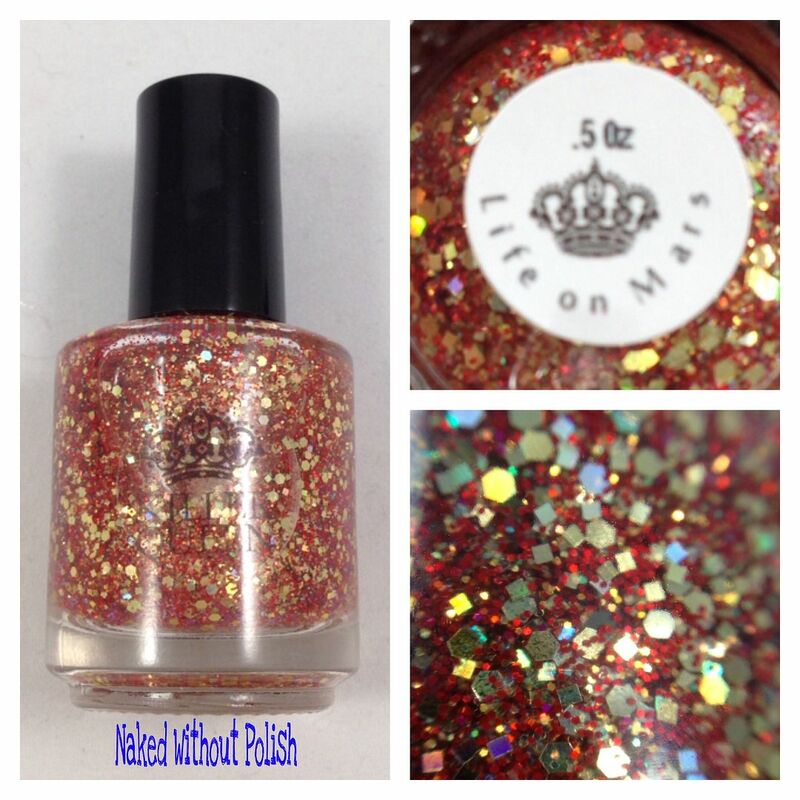 For a newer indie, Killer Queen Varnish is killing it! 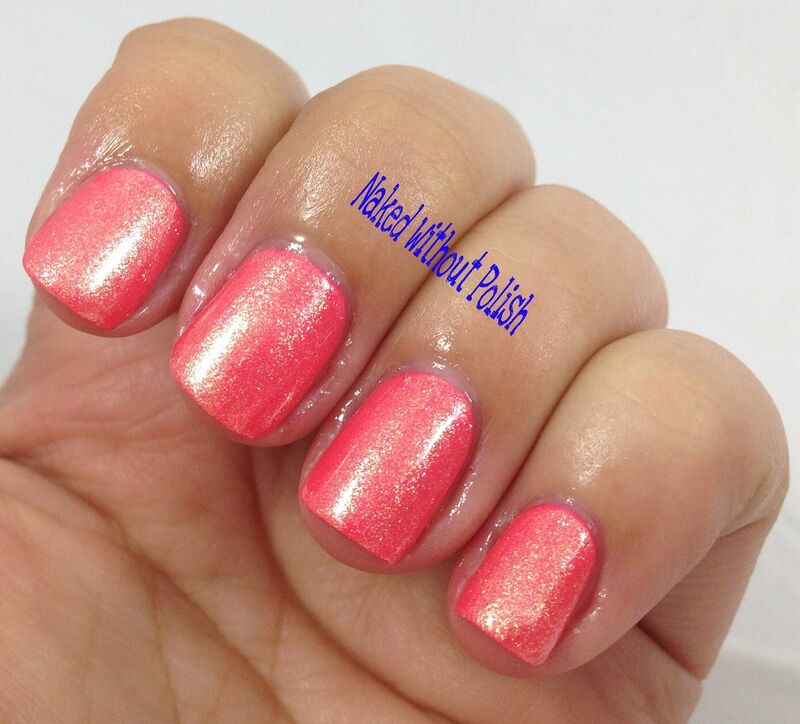 So much versatility in her toppers, good formulas, fun colors, and great names!! The price is wonderful too! I highly suggest you check out her shop, and IG (both links are below). 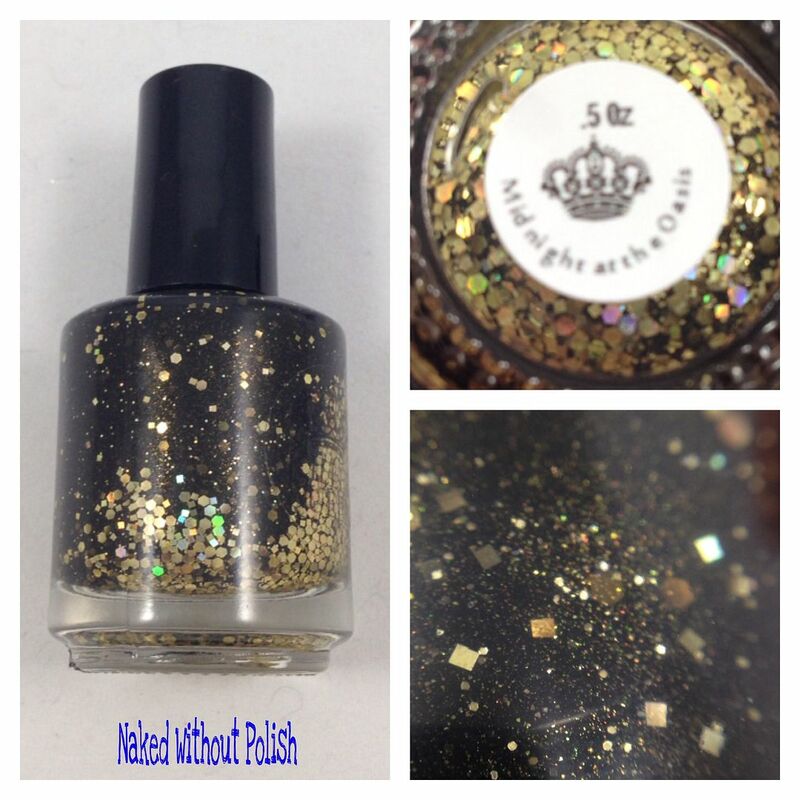 Killer Queen Varnish is one you're going to want to keep an eye on. I expect good things from her!